The Six Flags Man tells the story of Forrest Gump in the wild west. 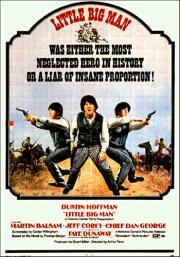 Penn's revisionist western is often very good but then borders slapstick in its attempts at satire. Very odd film. Typical of Penn, this revisionist western is torn between two worlds, with one foot firmly in the past while the other rooted in the precarious present (of 1970). As a satirical takedown of American imperialist expansion it holds a certain wayward charm, but Crabb is too much of a moron for the narrative to gather any real significance, and Hoffman struggles to pull off the physical comedy with any real conviction. The tonal shifting also results in a bumpy ride that's almost fatally prolonged. Offbeat western comedy that doesn't always work but most of the time is funny or interesting. Overall an enjoyable picaresque. Some corny and/or exploitative tropes about frontier times, but also some touching and insightful moments. Dustin Hoffman has a tendency to mumble and seem wooden, and I didn't like him in this - sometimes the character seemed slow or retarded which I wasn't sure was intentional. Reminded me of Northern Exposure with the different cultures and eccentric people interacting, except that it dealt with violent historical events so it was more disturbing at times. Quite a good western epic from start to finish, though it sits on the shoulders of "Run of the Arrow", and I certainly saw a persistent problem with its portrayal of women. Jul 05, 2014 Simon M.